And now it is all gone. It’s probably for the better, I don’t think it was very good for me to brood over anyways. I will instead talk about… quotes. If you haven’t noticed by now, I like quotes! I like big quotes and little quotes, green quotes and mean quotes. Curly quotes and straight quotes. I like quotes that jump up and down. I like quotes that make me frown. I like quotes that are sweet and rhyme, quotes are good almost all the time! I like them in my soup, I like them…uh… on a stoop. I like them everywhere! What’s your favorite quote? Do you dare? So, yes. Comment with your favorite quote, or just one that you like. PUHLEEZE. Happy June everyone! Jeff and I decided to take Maya to Gallup park (an especially nice one, it has duckies and lily pads). Occasionally Jeff gets weird about his beard and he’ll shave it off in stages. First (this time), is the “Amish man.” Appropriate considering our last name is Yoder. Anyway, I don’t mind this look very much… last time he did the “Chop” which made him look like a crazed motorcycle man- handle bar mustache and everything… yikes, then the super bushy weird 70s mustache, then down to the creepy french villian (I swear I refused to kiss him), then completely off. He looks 17 when he shaves completely, and while I love him forever, I must admit it’s a little weird. He thinks it’s hilarious. HA HA. I will keep you posted with each stage so you can all be witness to this atrocity. Maya LOVES to go for drives. Sometimes the wind pushes her ears and face back so much that I think she slightly resembles a polar bear. My grandpa turned 89! I don’t think he looks a day over… 75. yes. He is the best. I pretty much love everything about him. Jeff and I gave him a bottle of our home-brewed Pinot Grigio. I love being able to give wine for gifts. I made the label and tied sparkly ribbon around the top. Voila! Anyway, tonight we went to my parent’s to celebrate. I feel so grateful to be able to appreciate all of my grandparents into my adult life. “Human salvation lies in the hands of the creatively maladjusted.” -MLK Jr.
“‘I see no one on the road,’ said Alice. Lovely… I’m actually in the middle of Alice in Wonderland! HOME BREWED PINOT GRIGIO! WOOHOO! and last night i watched Eragon and Jeremy Irons said “I would rather ask forgiveness than ask permission” or something like that. i like that pondy picture! YAY! Baby, sideways, didn’t make a peep… er somethin. Very nice choice. Is that your Garyann up there in that picture? ha oh I forgot the “She’s small but she’s strong” bit of that quote. children make you older but first they make you young. I especially like that last one, I’ve never heard it before! …so appropriate for this stage in our lives! Good one! and Maya looks like Falcor! I don’t know what a falcor is… but I’m about to find out. 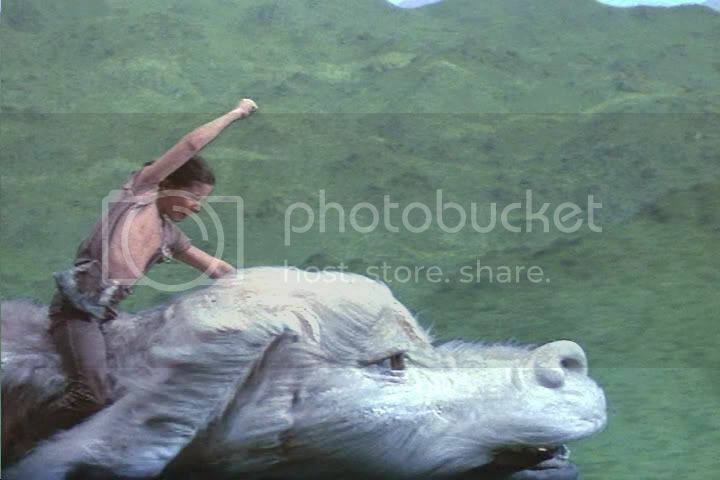 YAY NEVERENDING STORY!!!! I’m so putting that on my Netflix list. I haven’t seen it in years!